John Mitchell presented his annual Economic Forecast to the Portland Business Alliance on Thursday, Dec. 13. Economist John Mitchell bucked an emerging trend among many of his colleagues by not warning of a looming recession. Instead, during his annual Economic Forecast to the Portland Business Alliance on Thursday, he predicted the economy will continue growing through 2019, making it the largest expansion in U.S. history by June. 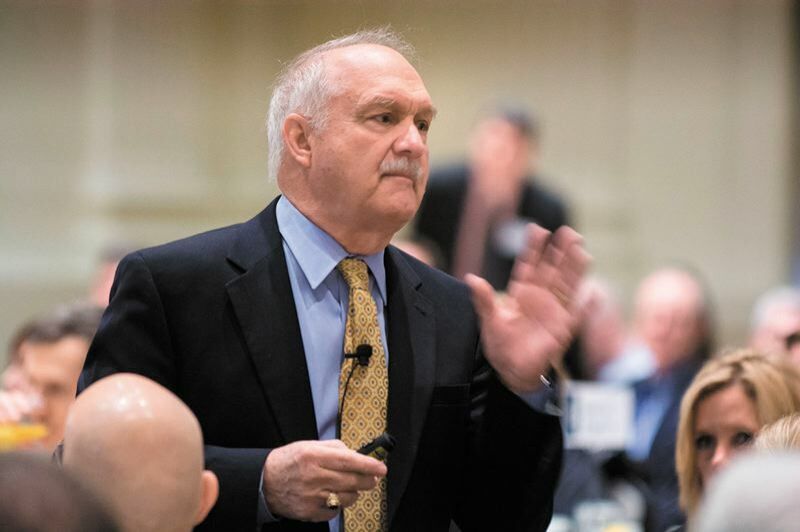 "It's a remarkable place that we're in," Mitchell told a capacity crowd at the downtown Hilton Hotel on the morning of Dec. 13, noting the economy has been expanding since 2009. Economists around the world have recently begun predicting a recession will begin by 2020 or 2021 at the latest. Although Mitchell focused on next year, he also said he did not see anything on the horizon that would trigger a recession, like tax increases, a series of rapid interest rates hikes, or financial wrongdoing in the housing market. "Do upturns die of old age? No. The Netherlands and Australia have gone more than a quarter century [without a recession]. We're just in the 10th year," said Mitchell, a former economics professor who was an economist for U.S. Bancorp from 1983 to 2007 and has served on numerous government advisory boards. Other economists are not so optimistic. The Wall Street Journal recently surveyed 60 private-sector economists, 59 percent of whom predicted a recession in 2020. Oregon state economist Josh Lehner said some national forecasts are predicting a recession by 2021 when the most recent revenue forecast was presented to the Oregon House and Senate revenue committees on Nov. 14. And, city economist Josh Harwood told the city council the current local construction boom is slowing down during an economic briefing on Dec. 11. Harwood said that even a mild recession would have a devastating impact on the city's budget, which is heavily dependent on business taxes and tourist revenues. Mitchell acknowledged many things could affect the economy in coming months and years, ranging from the U.S. trade war with China to growing political turmoil in Europe and the approaching need for Congress to raise the debt ceiling March of next year. Still, Mitchell noted the U.S. economy is the strongest it has been in nearly 50 years. "Unemployment is at 3.7 percent, the lowest it has been since 1969, when Nixon was president. There are currently more job openings that unemployed people," said Mitchell, who claimed the Oregon and Portland area economies are equally strong. "Oregon had the ninth highest job growth of any state in October. Employment is still increasing in the Portland-Hillsboro-Vancouver area. Unemployment is so low, Mitchell said, that many companies are eliminating barriers to hiring, like criminal background checks and drug tests to find enough new employees. "I had one business tell me they're now 'felony friendly.' Think about that," Mitchell said to nervous laughter. Mitchell said the most worrisome regional trend is a slowdown in the residential construction market, with building permit applications recently dropping 12 percent for single-family homes and 25 percent for multifamily projects. Home building has never completely recovered from when it bottomed out during the Great Recession, Mitchell said, and rising mortgage rates are discouraging potential buyers, even though the current average 4.8 percent is low by historic standards. "I had an 11 percent mortgage, but we've had 30 years of falling interest rates, so any increase is a shock to those who've never experienced it," said Mitchell. At the same time, Mitchell admitted he could be wrong. He quoted the late economist Hyman Minsky who famously said "stability breeds instability" by encourage people to take risks. "Are we missing something?" Mitchell wondered aloud, although he proclaimed himself "cautiously optimistic." The recurring Economic Forecast is a highlight of the PBA's schedule, in large part because Mitchell is a surprisingly entertaining speaker for an economist. He roamed the atrium ballroom with a clip-on microphone and punctuated his presentation with intentionally bad puns, allusions to obscure historical figures, references to current political events, and an original poem to summarize his forecast.